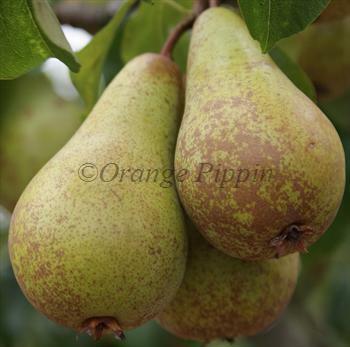 Concorde is without doubt one of the best pears for the UK. It is a fairly new variety, but combines the strengths of two classic 19th century varieties. From Conference it inherits reliability, cropping potential, and excellent suitability for the UK climate. From Doyenne du Comice it inherits top quality flavour. The result is a pear that tastes as good as many of the old-fashioned European pears, and yet grows well in the sometimes marginal conditions of an English summer. 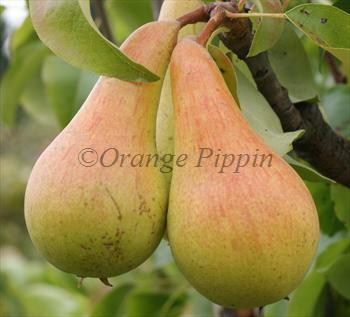 The fruit is very similar to Conference in appearance, tall and pear shaped with extensive russet. The skin colour is variable, normally a yellow-cream colour but it may sometimes be flushed from exposure to sunlight. Concorde performs well in many situations and is a good choice for growers who want to produce pears organically or without chemicals. Concorde® is a protected variety. 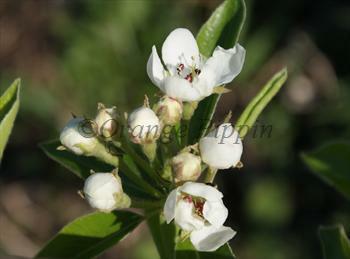 Please fill in the details below and we will let you know when Concorde pear trees are back in stock. Concorde and Onward are half-sisters, both related to Comice and both inheriting the high quality flavour of Comice. Concorde is in flowering group 4. Concorde is partially self-fertile, but fruiting will be improved if there is a compatible tree of a different variety nearby. Concorde produces a compact upright tree, but it tends to over-crop and it is very important to thin the fruitlets in June. Like all pears it can be difficult to tell ripeness on the tree, but if you lift and twist gently and the fruit comes away then it will be ready to pick. However leave the pears in a fruit bowl for a few days, until they become a golden yellow colour - at this point they should be ripe and ready to eat. Concorde is usually considered self-fertile, but in practice it performs much better if there is a compatible pollinator nearby and is best treated as being partially self-fertile. Like many pears Concorde grows with an upright form. It is also relatively slow-growing, and for these reasons is not necessarily a good variety for training as a fan or espalier. Concorde was developed at the East Malling Research Station in the UK, in the 1970s. It is a cross betweeen Conference and Doyenne du Comice.